This is Part 1 of a 4 part series. Links to the other posts are at the bottom of the page. I recently had a Swedish friend over to visit in Scotland. Aberdeen has (sort of) become my second home so I don't always view the city as a visitor anymore. It was lovely to have a chance to explore this part of the world again. We only had 4 days, not a lot of time. 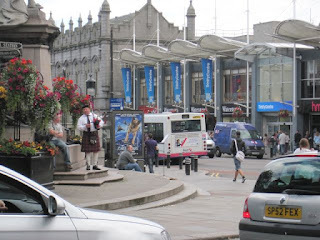 I decided that we would do a walking tour of Aberdeen the first half day. We stopped in at the Tourism office in Union Street and they kindly printed out a walking tour for us. Just a note here. The Tourism office is not open all day, every day. They open later than most of the other shops in the area, they close for lunch, half-days on Saturdays, and closed on Sundays. Also there is one, maybe two people at most to help. Aberdeen is clearly not a massive tourist destination. The tour starts at Castlegate, which is the furtherest end of Union Street - not too far from the Tourism office. The walk weaves around Union Street taking in historic buildings, statues and examples of Aberdeen architecture. The printed brochure includes a map and interesting information. For more on what to do in Aberdeen read - here. Aberdeen is known as either the Silver City or the Granite City due to the silver granite buildings that comprise most of the city. It's the third biggest city in Scotland and is a major fishing harbour. However fishing is small fry compared to the oil industry. Aberdeen is the oil capital of all Europe. The walk takes around an hour and a half, depending on how long you make it. If you have time in hand, and want to include a bit of shopping, or people watching, the two main shopping malls are Union Square and the combo of St Nicholas and Bon Accord Centre, which are right next to each other. You'll find Union Square by going down Market Street off Union Street. Head down towards the harbour and then right into Guild Street. The other two shopping centres are behind where Market Street meets Union Street. As a greenie I love the plethora of UK charity shops which usually stock exceptionally good quality used clothing. I've bought an almost new Marks and Spencer leather jacket for £6. (Do vegetarians wear leather? I wear recycled leather clothes but not new. Read - this - for an interesting take.) Look out for charity shops along Union Street. There are more of them further along Union Street and up Chapel Street. My favorite area in all Aberdeen is The Spital where Old Aberdeen is. Read about it - here. I don't eat out much in the UK. I find restaurants very expensive and the food is not great. Service is, sorry to say this, OK. My view is tainted by the fact that I'm vegetarian. Very rarely on my travels anywhere have I found a good vegetarian meal and most Western European places are reluctant to modify a meal to accommodate me. I prefer to buy a yummy take-out and eat next to a river, in a park, on a beach or even relaxing in a hotel room. No fighting, no stress and no disappointing end to an evening. Supermarket food is brilliant and service is usually excellent. In Part 2 - here - I talk about where to find food. Part 3 - here - deals with road trips via the coast, stone circles, the Cairgorms National Park and the Royal Deeside area. In Part 4 - here - I talk about Edinburgh. For more on Scotland visit - here. Go to - My Holidays and Trips - at the top of this page to read about other places we have visited. Or just click on - this link.